The attitude expressed in the sender’s question is telling of the importance of sending thank-you notes. It demonstrates a positive and optimistic mindset. Thank-you notes represent your finest human ability of expressing gratitude and welcoming the next moment with arms wide open. What thank-you note ever closes on a downer? Like personal thank-yous, business thank-you notes are appropriate whenever you want to express gratitude and leave the door open to the future. In both, one person writes to another person. The words “thank you” and the precise, specific mention of what you’re thankful for are necessary. They also directly or implicitly indicate the benefit you’ve received. Sincerity is always a must. Exuberance is not required, and exaggeration should be avoided. Grammar and spelling are essential in both personal and professional thank-you responses. 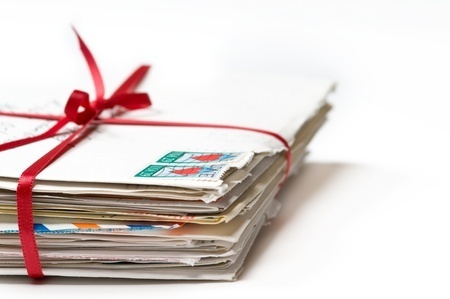 A hand-written note is always better, but a printed letter on your company's letterhead is also appropriate. 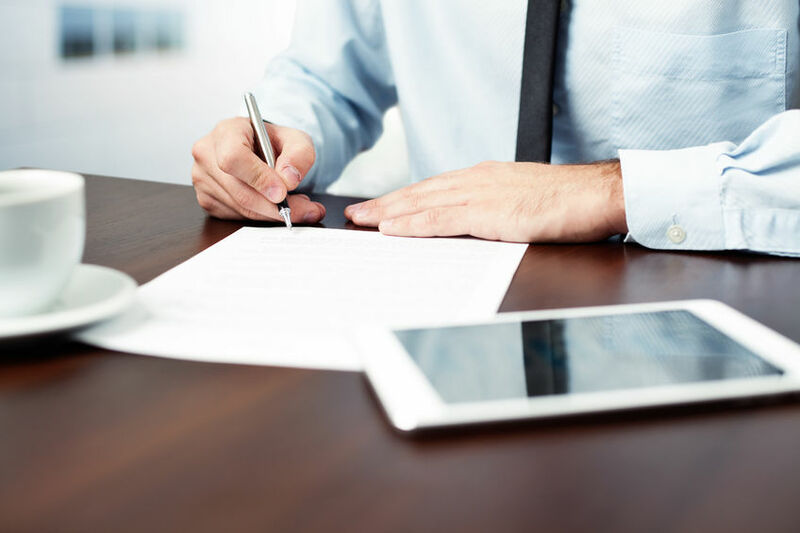 After a contract is signed or a successful transaction has occurred, it’s very appropriate to respond right away with a note of appreciation via email. Even as you simultaneously follow up with your hand-written thank-you note or letter of appreciation within twenty-four hours. If you send an email, avoid mentioning the written note to follow. It will be pleasantly received when it does arrive. 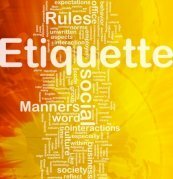 It’s true that business is often conducted in social settings and any communication you send will be friendly and personal. Your note should leave its recipient feeling glad they’ve worked with you and upbeat about your interactions. First impressions are always important, and in business there may be a lot at stake. Your note will be an expression of gratitude, but just as important, it is a gesture of respect for the other person and what that person made possible. Depending on the setting, a thank-you note might seal a deal or open the door for the next job interview. Thank-you notes send a positive signal: you understand that business is about relationships and you aim to have strong ones. You represent your company at all times. Whatever impression you leave reflects on your company. Even a small show of gratitude gives the perception that your company is likeable and trustworthy - and that you are as well. 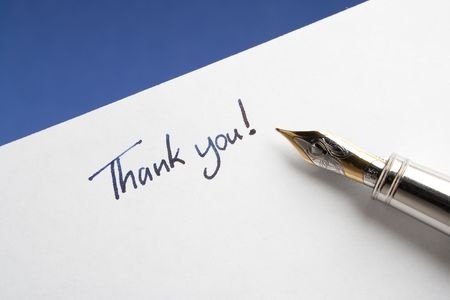 Thank-you notes or letters in business often have a second intent, not only expressing appreciation, but demonstrating that you are someone who follows up. Notes of gratitude in the professional realm border on being more formal. The key is to write with intention and thoughtfulness, and in your own voice. The closing of your thank-you note is a statement of hope for the future. Showing your personal flair may be better suited in social thank-yous, though a positive attitude will shine through in personal and business. Legibility is especially important in business communication, especially those hand-written notes. Write a draft and edit so that the entire text of the note fits on one side of the paper or card, and avoid leaving large blank spaces. The pronoun “we” might be used when referencing your organization or your team, but the note is from you alone. The note is signed by you alone. Address the envelope to the individual, including that person's professional title. If you are writing to an entire department or team, address it to the department, or to the department manager and team. It is always best to send a note of gratitude immediately or within a day or two of the event for which you are thankful. But life - and business - happens, and time can slip away from you. Using tardiness as an excuse for not sending a thank-you note is easy to do, but I advise you to send one anyway. A late thank-you is better than no thank-you! Don't make excuses for your tardiness. Perhaps make your note a little longer, mentioning any happenings on the project or transaction that prompted your thank-you. Occasions for writing a business thank-you note are practically endless. The bottom line is that you will never regret sending one. One piece of advice: Never “feel you should” write a thank-you note. Get a drink of water or go for a walk to make yourself available for your own sentiment of gratitude to show up!